This article came into being as Morgan Stanley, stated that investors should look forward to low returns only. 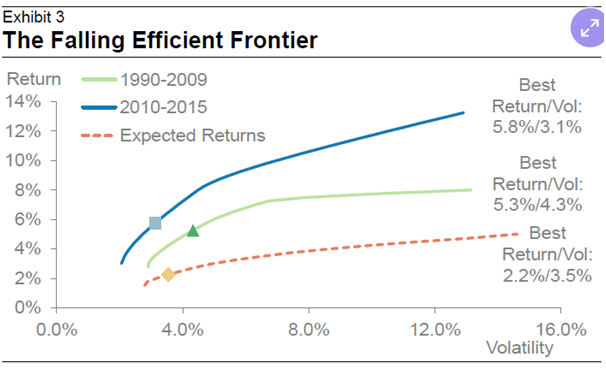 They based these claims in part on the “The falling Efficient Frontier model”, depicted below. Their definition of paltry equates to gains of roughly 5% a year. If that is the case, most investors are already used to well below mediocre as, an enormous percentage of the populace is sitting on the sidelines, or they have parked their money in treasuries. You do not have to settle for mediocre returns, for the model these chaps are using is flawed at best. This model states that the best of times are behind us and that going forward the outlook is not so bright. In other words, this model is about to collapse. How should you react to these so-called erudite predictions; ignore them for other than a lot of hot air, they are not a reflection of reality. Right of the bat, logic should kick in; the problem is the model, not the markets. Hence, the only fitting place for such advice is the lowly trash can. In effect, what Morgan Stanley is stating is that the only way to make money now sacrifice growth for risk. We think that many individuals have already made that choice, especially in this ultra low rate environment that punishes savers and favours speculators. Has it ever been easy to make money in the markets? Diversify; do not fixate on one asset class or one sector only. Spread your beats. If you are young, you can afford to take on more risk as you investment horizons are different from those who are fast approaching retirement age. To demonstrate that stocks are far sexier than Bonds, we randomly selected some ETF’s plotted their returns from 2002. 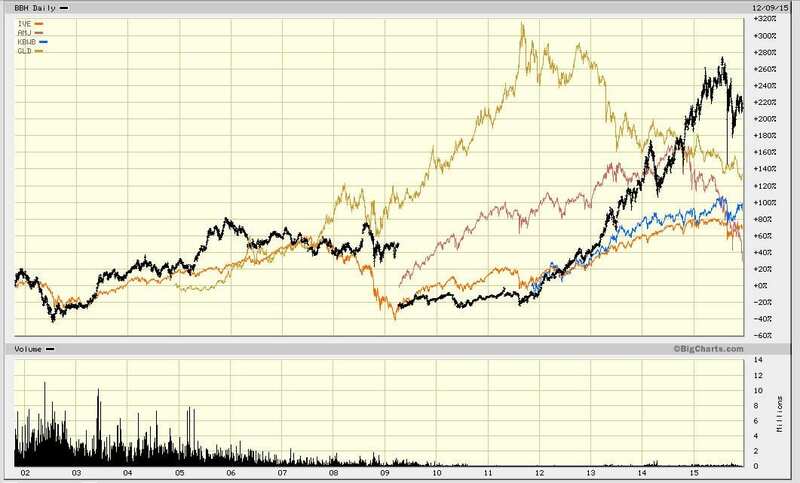 We even included the Gold ETF, which has been one of the worst-performing ETF’s for the past three years and the returns were still not too shabby. Now Imagine you focused on finding the strongest stocks in the strongest sectors, how much better the results would be? In the end, it is your money, do not listen to the talking heads or the so-called experts. Take control of your money or someone else will.